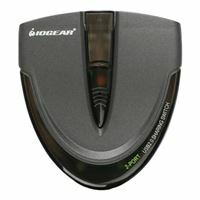 IOGEAR's USB 2.0 Automatic Printer Switch allows two PCs and / or Macs to share one printer or multi-function printer. Simply submit a print job and the printer automatically* switches to the preferred computer. The switch also enables two computers to easily share one external hard drive, scanner, or any USB device. No more plugging and unplugging between computers.